Where to stay at Disney World is a big decision: Walt Disney World has an area as big as Boston, and within it are twenty-two very different resorts. Some families just love a particular resort because of its themes, such as the Animal Kingdom Lodge, which has fantastic architecture and decor, and savannas outside where guests can see African animals. Then there's location. Disney World is huge, and the drive from a resort to a theme park can take fifteen minutes. Families who favor Fantasyland, or like to see the nightly fireworks at the Cinderella Castle, may want a resort near the Magic Kingdom. Another prime location is the cluster of resorts around the boardwalk and lake beside Epcot. Even resort types are varied. Choose from Value Resorts, Moderate Resorts, or Deluxe Resorts which typically have an evening kids club, concierge rooms and suites, fine dining, and a spa. Other options include Vacation Club Resorts (which are available for rent by any guests and have residential-style units that can sleep up to twelve), and the unique Fort Wilderness Resort and Campground which has cabins and campsites. But first, the big question — whether to stay on-property or off-property? Many Orlando properties try hard to beat Mickey! Staying at a Disney World Resort offers some nice perks, and they start when you arrive at the Orlando airport. Guests don't even need to pick up their luggage — before their trip, special Disney luggage tags are mailed out, and the tagged luggage is picked up at the airport and delivered to guests' rooms. Transportation is also provided between Disney World resorts and the parks themselves. To get to the Magic Kingdom, the most convenient scenario is to stay at one of the Disney World resorts that have monorail or boat transportation. Both options are fun, convenient, and save time. The monorail continues on to the Epcot theme park as well. Epcot and Disney's MGM Studios can also be reached by boat. Don't assume, however, that your bus ride from a Disney World resort to a theme park will be quick — Walt Disney World is the size of Boston and the ride to the theme park of your choice can take fifteen minutes, plus the wait time for a bus. (Most buses run about every twenty minutes.) The buses are a huge convenience but guests need to allow time to get around. Meanwhile, visitors who aren't staying at Disney World have a couple of options. Most non-Disney resorts offer free shuttles to the theme parks, but typically these shuttles run just a few times a day. Visitors probably won't be able to return to their resort mid-day to give little kids some nap-time or a pool break, which is a good strategy during a hot day in the theme parks. And at night, guests need to return to the right bus parking lot and locate the right bus, out of many, for their resort. Alternatively, guests could drive their own vehicle to a theme park in their morning, which may get the day off to a quick start. The end of the day may be more complicated: guests who've park-hopped using the Disney Bus system will need to get back to where they parked the car. Besides the free Magical Express airport shuttle and the free Disney bus system, Disney World gives several other nice services to resort guests. Guests at Disney World resorts are entitled to Extra Magic Hours: every day, guests can beat the crowds at one theme park by entering an hour early, or staying for later evening hours. The excellent water parks, Typhoon Lagoon and Blizzard Beach, offer morning Extra Magic Hours too. If the theme parks are overcrowded, Disney resort guests have never turned away. Purchases made in the theme parks can be delivered to a guest's resort. Disney resort guests can buy the Dining Option that can be added to the Magic Your Way base tickets for admission to the theme parks. The Dining Option is generally considered a good deal. Another good feature for families is that the main pools at the Disney Resorts are lifeguarded. Each Walt Disney World resort has a theme and is designed for family fun. For example, Disney's Polynesian Resort, with a South Pacific theme, has a Volcano pool. 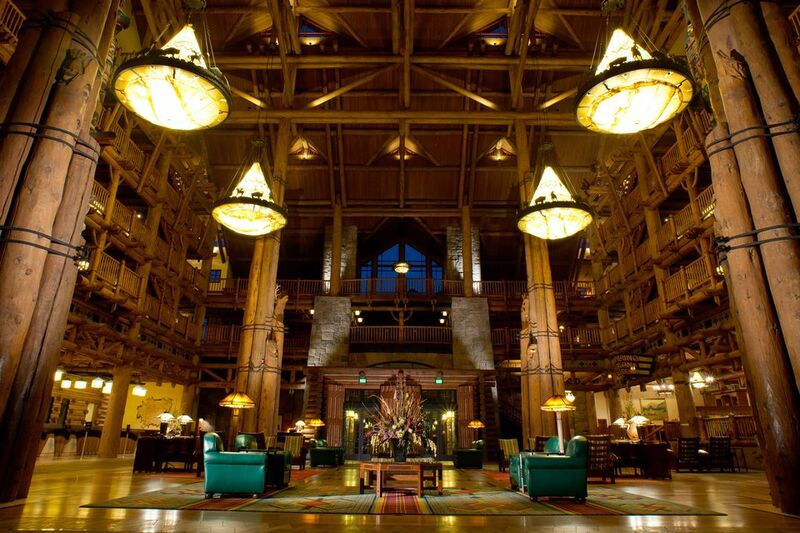 The Animal Kingdom Lodge has stunning architecture, and guests can watch giraffes and other animals roam a savanna. Many guests return to Disney World year after year and have a favorite themed resort. But of course, many off-property hotels are fun, too. For example, Nickelodeon Family Suites has two waterparks right on-site, plus Sponge Bob and other Nickelodeon theming, and great games and entertainment, also by Nick. Price at Disney Resorts is by the room, and kids under 18 stay free. Some Deluxe rooms can sleep five, and at some resorts (like the All-Star Movies resort, for instance, which is a Value resort) a crib can be added so that a family of five can stay in one room. And the Disney's Vacation Club resorts — which are available for rent by any guests — have residential-style suites that can sleep up to twelve. The value resorts at Disney World are a bargain. Rooms are smaller than at the Moderate resorts and there are fewer pools, but the Value properties are colorful, cheerful, and fun, often cost less than $90/night, and offer all the perks of a Disney resort. A family of four can sleep in one room. Moderate resorts such as Riverside-Port Orleans offer guests a lot for their money and have huge grounds with on-site fun such as kayaking, playgrounds, etc. Always plan to spend a day just enjoying your resort. The Deluxe Resorts — such as Grand Floridian or Animal Kingdom Lodge — have beautiful grounds, multiple pools, fine dining, optional Concierge level, a kids' club, spa, and more. For those with an eye on the budget, a great option is to camp at the Fort Wilderness Campground and Resort. This huge property has many activities and amenities, plus guests can take a boat to the Magic Kingdom. Tip: keep an eye out for seasonal promotions that lower the prices at all Disney World resorts. Meanwhile, budget-wise travelers who want to stay off-property can find many promotions on hotel booking sites if they look early enough. Families can also save money by staying at all-suites properties with kitchens for preparing their own meals. Still, visitors will be hard-pressed to beat the price of a Disney World Value Resort, especially when factoring in perks such as the free Magic Express airport shuttle and the Disney Bus system. Guests who have their own cars can save money by eating at restaurants outside their resort. There's even a McDonald's within the Disney road system, near the Blizzard Beach water park. Guests with cars can also save money on food by staying off-property at inexpensive suites with kitchen facilities, or by renting a vacation home (a great option for multi-family vacations.) Also, some non-Disney hotels and resorts offer free meals for kids when kids dine with a paying adult. Certain Disney lodgings have kitchens, i.e. the Vacation Club Resorts — but these are not a low-budget choice. Wherever you stay, and even if you cook your own meals every night, try to budget for a splurge at one or two of the restaurants in the Disney World theme parks. Character Meals with all-you-can-eat buffets, for instance, are both filling and fun.